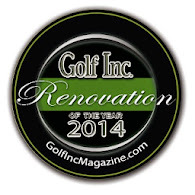 Last week I got to share with you all the fun, constructive things we were doing to improve the course. Well "Hold Everything", the wind blew, and when the wind blows at Tacoma, we have to stop doing all those constructive things and clean up the place. 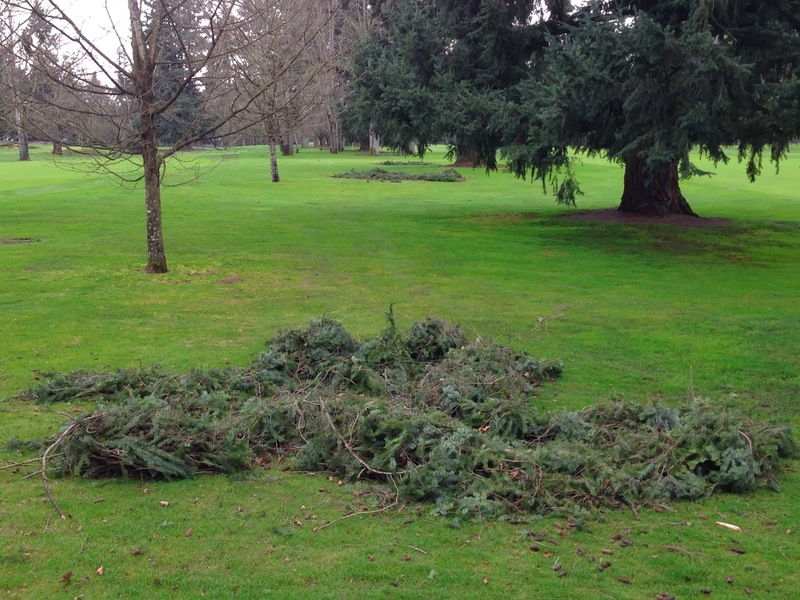 Last Saturday we had gusts up to 46 mph and that wreaks havoc with all our trees. 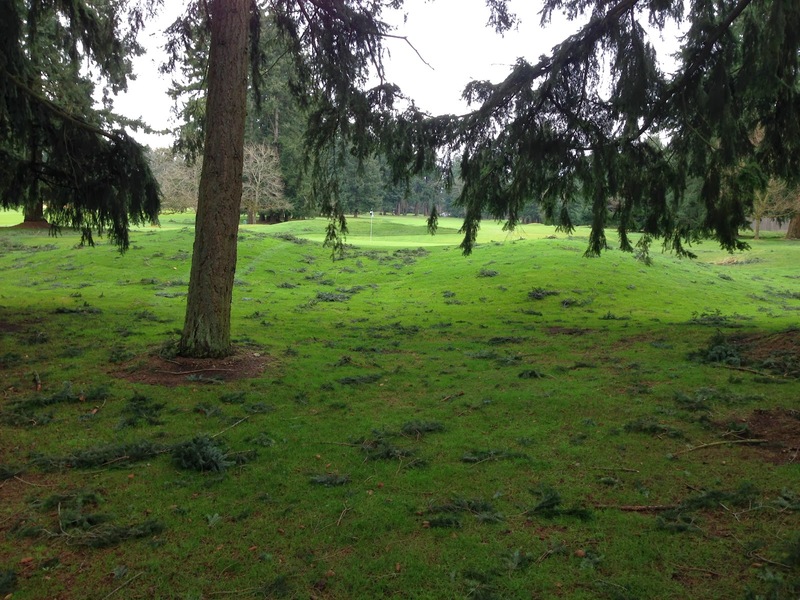 With wind like that the course quickly becomes unplayable and all of our focus goes into blowing off the surfaces. We start down the middle and work our way out to the treelines. Above you see #2 as it looked the day after the wind blew. #2 at Tacoma is the most expensive golf hole on the planet to maintain. Okay I made that up, but it really feels like it. Not a day goes by that we don't blow something on hole #2. If we get even the slightest breeze, we blow the entire hole. If it is a calm day we can maybe get away with just blowing off the green or teeing ground. I've never counted them but I'm guessing there is several hundred trees just on hole #2, and most of them are close to 100 years old. This is pretty young for a douglas fir tree but they are still big and trees like that make a mess all the time. Jason spent all week on the tractor blower and no one is better than him at gathering debris. In wooded areas, we blow everything around the base of trees where we pick the piles up by hand. This allows us to pick up debris that has fallen over the last several weeks or months at the same time we pick up the fresh storm debris. There is always some kind of debris under the large trees so doing it this way means we get the place pretty clean once all the piles are picked up. Right now the course is covered with piles like these that are waiting to get picked up. This past storm was fairly significant so realistically we will be spending several weeks picking up these piles. As much as I'd like to have guys doing constructive things, we must get these piles picked up or the grass will eventually die from being smothered by debris. 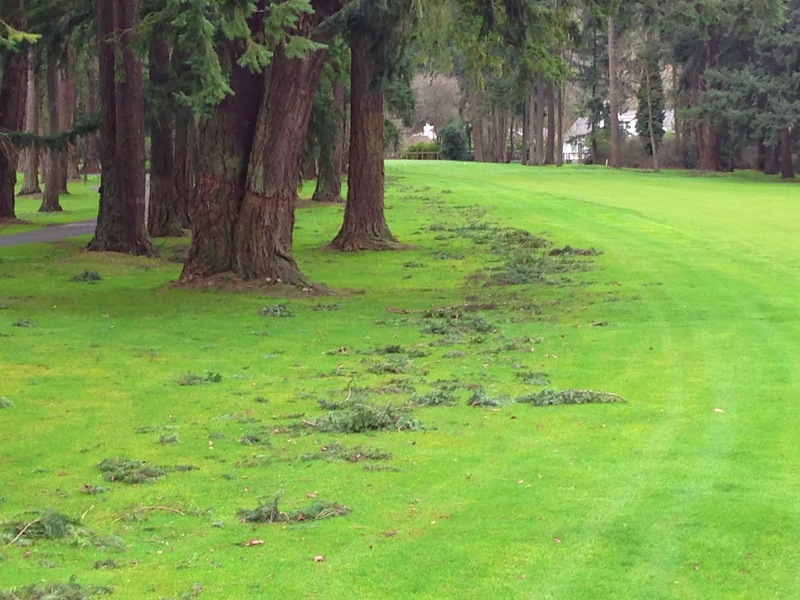 All we can afford to do in addition to storm debris removal is pick away at the poplar stumps on 13. The stump grinder person was here on Monday and so the stumps are basically gone but that was just the beginning of restoring the area near 13 green. 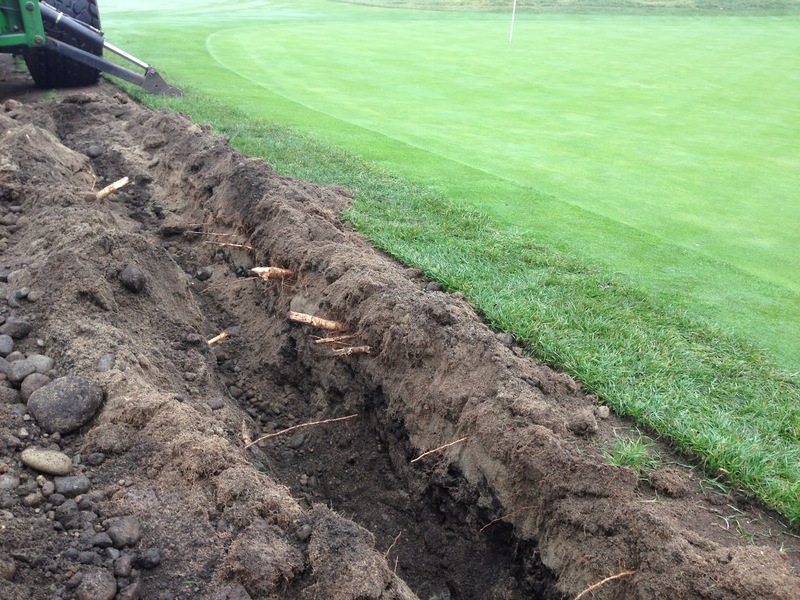 We have begun the tedious job of pulling out all the shallow poplar roots. First we went after those that were under the green. 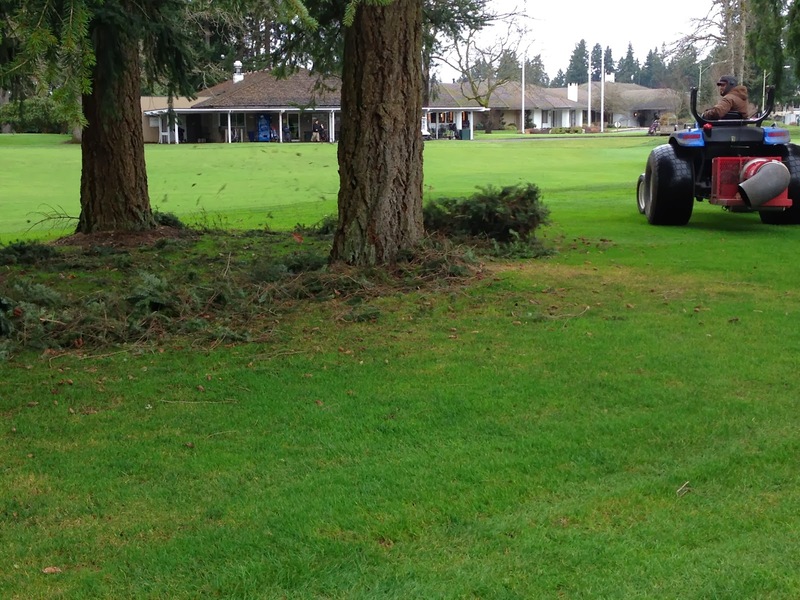 It's important to locate these roots, cut them and apply stump killer to those cuts so that hopefully we can kill the root system that is under the green. If any of those roots survive, they can send up shoots that would start new poplar trees. Obviously that would not be good for the quality of the putting surface. 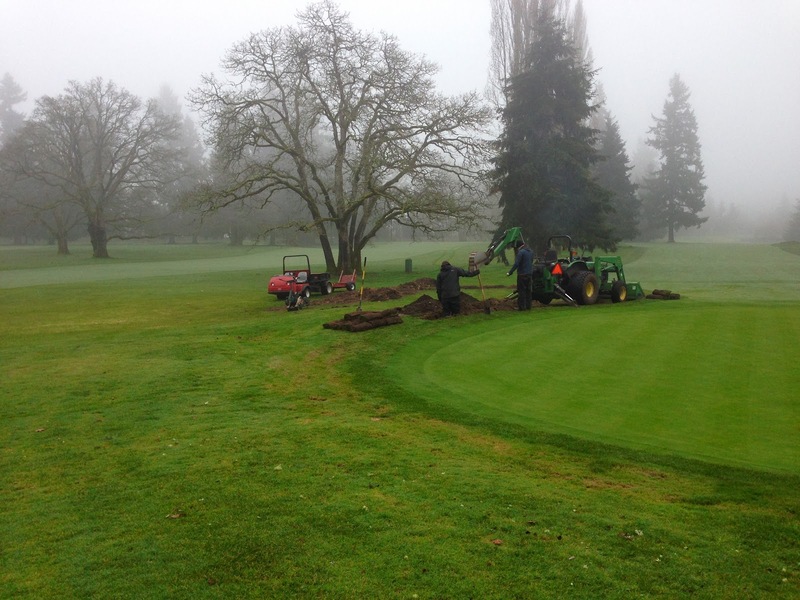 Below you can see that we did locate those roots that are under the green. Now we are just methodically going through the whole area looking for shallow roots and pulling them out. This is making the area look like a battlefield. 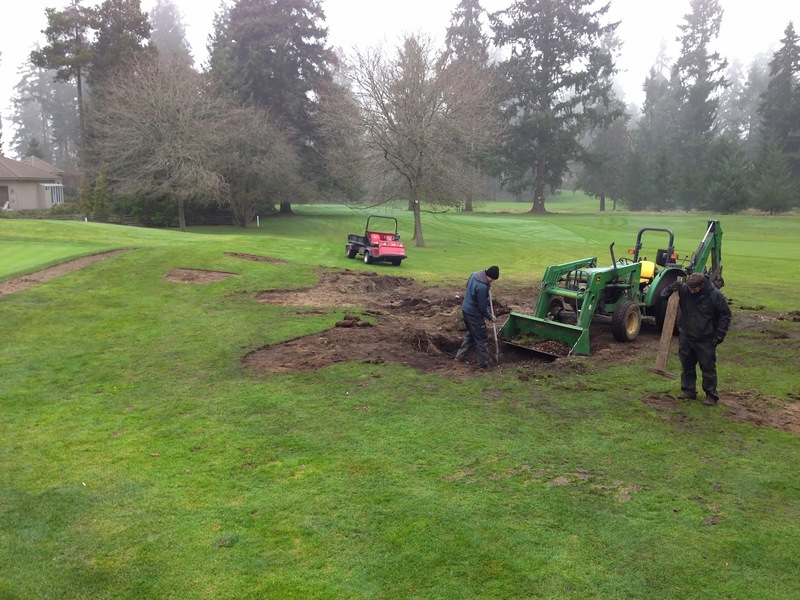 It will take some time to get it back in shape, and since the area will now be fairway turf, it needs to be restored to a smoother condition than it was before we began. 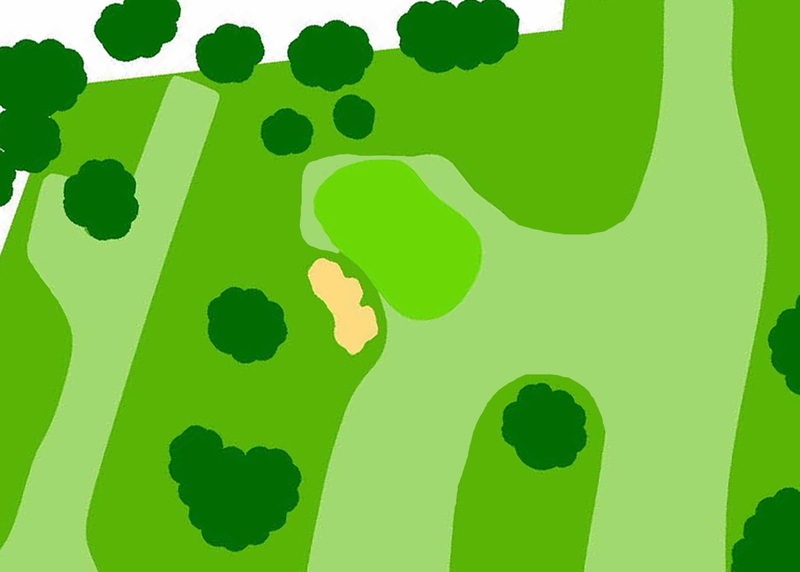 Below is a diagram from our Master Plan showing what the mowing pattern will look like here once the area is restored. You can imagine there will be some fun and challenging shots attempted from this new "short mowed" area. I cant wait to see how it turns out.